With the rise of iOS devices, there's been an increase of on-the-go collaboration and the need for tools that can manage teams and contact information. iPhones and iPads can hold thousands of contacts, but when it comes to arranging those into groups, Apple's Contacts app offers no help. I've been testing Interact by Agile Tortoise for the past week, an app that offers a variety of features that allow you to create contacts and organize them. Interact also works with group texting and email, so you can do more meaningful work in groups. Although it has its hiccups, Interact's capabilities far outweigh its negatives. Interact works with your existing iOS Contacts to assemble them in one unified location (by no fault of Agile Tortoise, Exchange contacts don't support groups). For more information on how Interact handles your contacts, you can find documentation here. Because Interact works deeply with your synced contacts, you also should be aware that deleting a contact in Interact will delete it from all of your accounts. The interface for Interact is straightforward - it basically dumps all of your contacts into a page. It's not elegant and I think it'd benefit Agile Tortoise to rethink the setup. To fit with their focus on group contact management, displaying all created groups first with the option to tap and view all contacts would be an improvement. Contacts are listed with a name, picture, and a set of four options: add to a group, share (and view), view (and edit/call/text), and delete. Given my description, you may be able to guess that I'm slightly dissatisfied with this complexity; if done right, these could be combined into two choices: view (where sharing, editing, calling, and texting can all be performed) and delete. Because Interact allows you to simply tap on the name or surrounding area to add to a group, an option for this seems redundant. My criticisms may seem harsh, but it's only because I see immense potential in the group management features of Interact. At its core, Interact is a simple way to assign contacts to groups and perform actions to one, multiple, or all members of a group. Creating a group is as easy as tapping contact names and clicking on the Interact icon at the bottom right of the screen. From there, the app will ask you to add to an existing group or create a group with the selected contacts. In addition, this menu can be used for bulk deletion, sharing contacts, and clearing the context. But within groups is where Interact proves its name. From the group screen, you can view all of the individuals within the collection and compose messages and emails with text and attachments. 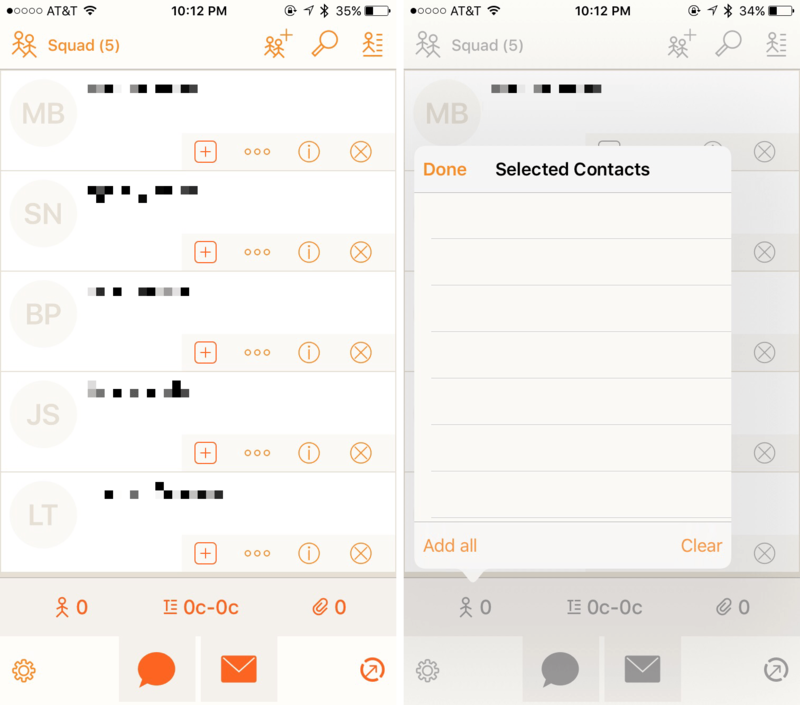 Choosing to select only parts of the group to contact works, of course, but you're most likely going to want to select all contacts using the menu option "add all" when tapping on the stick figure at the bottom. Using the text composer in the middle of the bar, you can create a simple text message or email, including a subject. There's a character counter as well, in case that's something you need to keep track of. If you'd like to add an attachment in the form of an image or document, tap on the paper clip. With these tools, Interact makes it very easy to send a document out to a group of people or share an image with family members. There are other ways to do this, but for sending information to a group, Interact is a fast and effective solution. In the hope of better contact creation through plain text identification, Interact sports Contact Scratchpad. By tapping at the top right (on the icon that looks like a stick figure with some lines), you can type in the name and phone number of an individual. From here, Interact will interpret the numbers and words and create a contact that you can save. However, with the application of tags, you can add fields such as company name, address, or nickname. 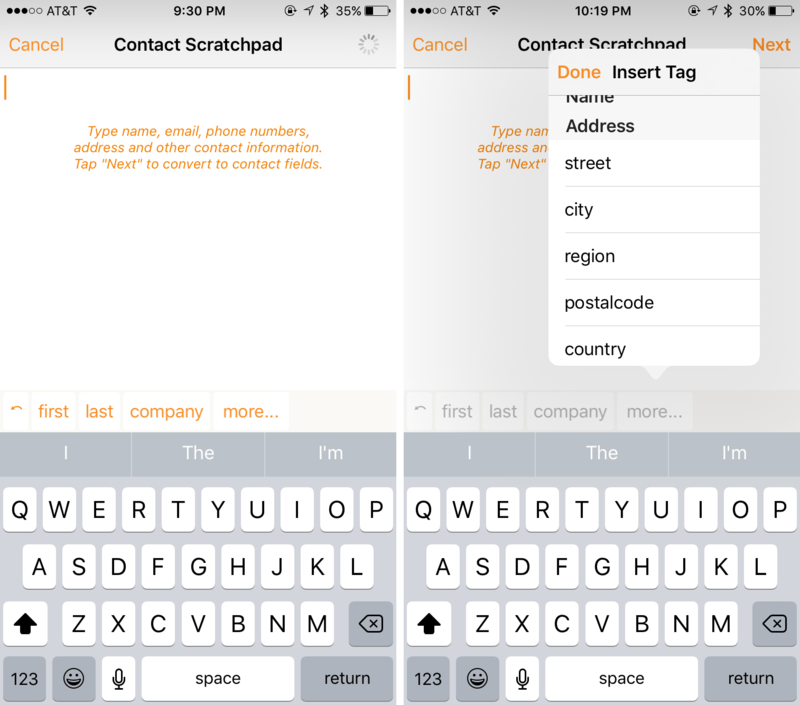 I found that by adding the necessary information while subtracting what I didn't need, using Contact Scratchpad was a quicker experience than going through the traditional contact creation of the native Contacts app. 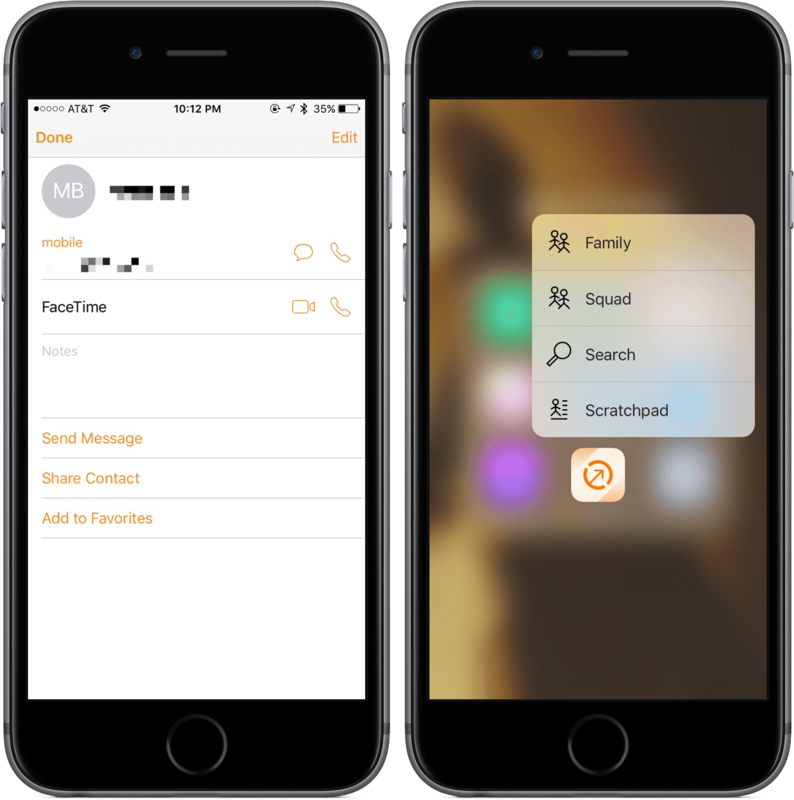 Interact also includes action extensions for quick access to different groups, search, or Contact Scratchpad; Apple's Contacts app only offers two: "Create New Contact" and "Show My Info". Interact vs. Contacts: Who Wins? On many occasions, apps that look to cater to both power users and the average consumer fall into the trap of creating a bloated piece of software that neither parties want to use. Interact, although powerful enough to be useful for those who need the most out of a contact app, remains simple enough for most people. With Interact, I've been assigning my college contacts into groups in order to see who I've worked with on certain projects. Throughout my usage of Interact, I've learned that it is completely capable of replacing the default Contacts app. 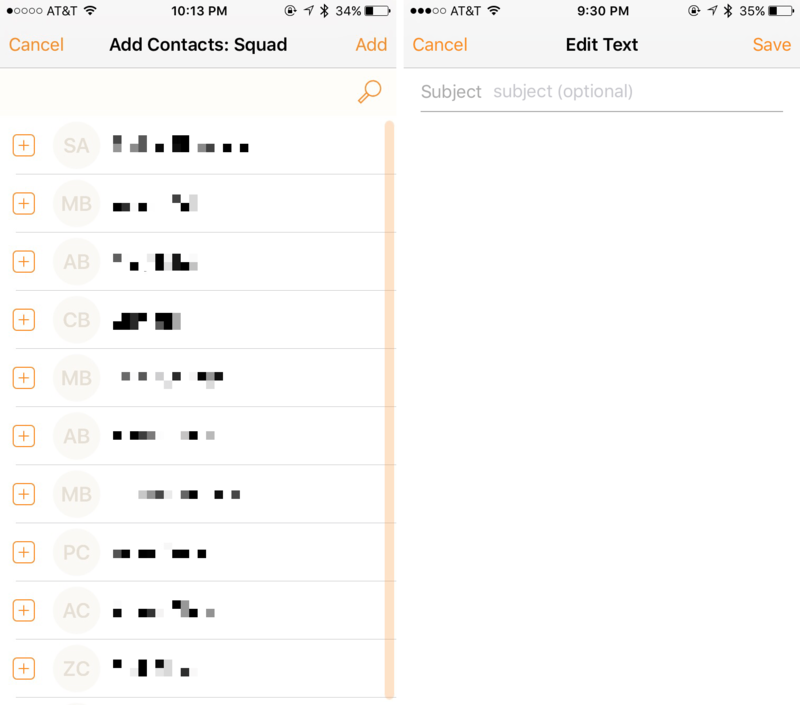 Without the ability to create and interact with groups on iOS, Contacts lags far behind Interact in its ability. Frankly, Interact shines a light at the negligence Apple tends to give some of its less-discussed software. For those who work on projects with colleagues, organize events, or need to send out group texts or emails, Interact is a tool worth checking out. Where apps like Spark and Fantastical have stepped in and improved on Email and Calendar, so too can Interact for Contacts. You can find Interact on the App Store for $4.99 as a Universal app.